The Wigingtons choose to power their remote estate with renewable energy—it would have cost them twice as much to bring in the grid. 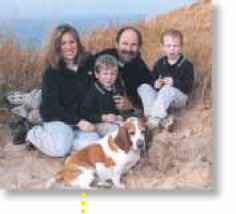 Learn how this on-grid family switched over to renewable energy by starting with a small system and then jumping into a larger one. Heat from the earth is so cool! Efficiently heat your home with a ground source heat pump. Hands-on workshops in Burma are spreading renewable energy throughout the country. 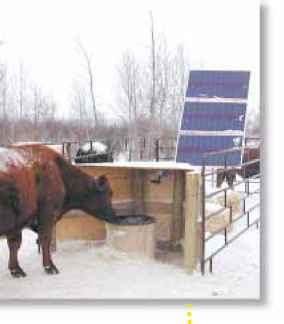 This cattle watering system keeps water from freezing—providing high quality drinking water to the herd all winter long. Dane and Minga Wigington in front of their PV array— near Lake Shasta, in northern California. SEI's women-only PV workshop installed 1,485 watts of green power on the grid and provided professional RE training. Solar air collector systems provide heat without some of the complications of solar hot water systems. Keep the weakest link in your RE system at its best by following this maintenance regimen. Outback Power Systems PV Combiner box. 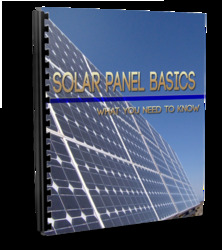 Clearing your solar window can be an emotional experience. 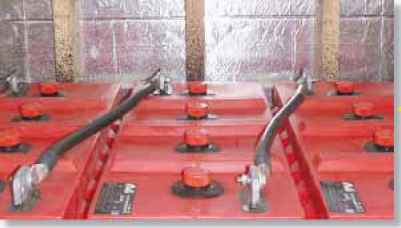 How to use direct current to expand the capability of your RE system. Knowing your EV's battery status helps predict driving range, extend battery life, and prevent wasteful overcharging. 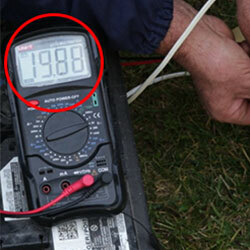 Features an off-grid, code-compliant system. 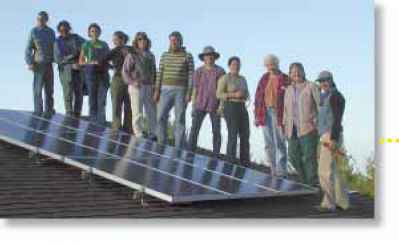 By opening her door to people attending Ashland, Oregon's Tour of Solar Homes, Risa Buck opened a lot of minds to renewable energy and sustainable living. Folks living with renewable energy (RE) systems know that they work. So what's the best way to educate people who are curious about RE? Show them these systems at work! This is exactly what happened on Saturday, October 4, 2003 with the American Solar Energy Society's eighth annual national Solar Tour. Forty-five states and over 160 cities participated in this year's tour. Newcomers to RE had an opportunity to see sustainable technologies in action, and talk with people who live with the technologies every day. 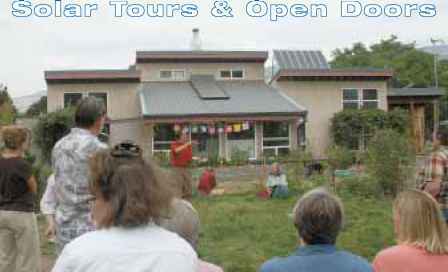 Here in southern Oregon, the city of Ashland, the Bonneville Environmental Foundation, and Home Power magazine co-sponsored and organized a tour of six local homes and businesses. Almost 100 people from our small southern Oregon community took part in the tour. In this day and age, when a lot of people don't even know their neighbors, the recent solar home tours stood out in stark contrast. Homeowners opened their doors to people they had never met, and shared their sustainable homes and lifestyles. As a result, the national Solar Tour went way beyond its goal of spreading the word about renewable energy—it helped to bring communities across the U.S. a little bit closer together. And that is a great way to spend a Saturday afternoon. Purely from a financial standpoint, people on the grid without solar hot water are way behind the times, and people with solar electricity are just a little ahead of their time. 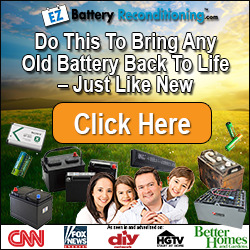 Copyright ©2003 Home Power, Inc. All rights reserved. Contents may not be reprinted or otherwise reproduced without written permission. While Home Power magazine strives for clarity and accuracy, we assume no responsibility or liability for the use of this information. Legal: Home Power (ISSN 1050-2416) is published bi-monthly for $22.50 per year at PO Box 520, Ashland, OR 97520. International surface subscription for US$30. Periodicals postage paid at Ashland, OR, and at additional mailing offices. POSTMASTER send address corrections to Home Power, PO Box 520, Ashland, OR 97520. Paper and Ink Data: Cover paper is Aero Gloss, a 100#, 10% recycled (postconsumer-waste), elemental chlorine-free paper, manufactured by Sappi Fine Paper. Interior paper is Connection Gloss, a 50#, 80% postconsumer-waste, elemental chlorine-free paper, manufactured by Madison International, an environmentally responsible mill based in Alsip, IL. Printed using low VOC vegetable-based inks. Printed by St. Croix Press, Inc., New Richmond, WI.